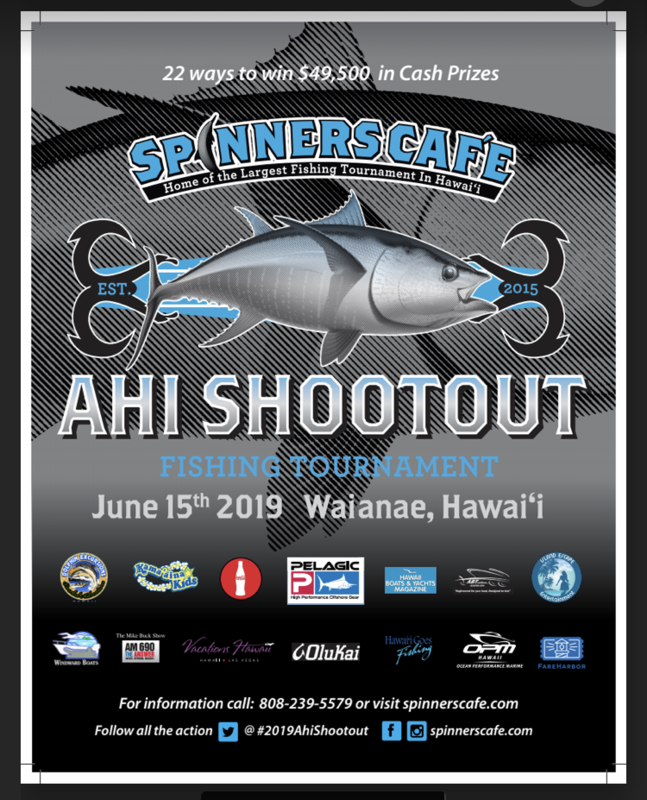 Enter online here at spinnerscafe.com, by phone 808-239-5579, or by mail (Entry forms at Spinners Cafe and next door at West Side Marine). 22 ways to win cash prizes with 150 boats! April 15 – Entry open, $400 for teams up to 6 members, $50.00 per additional crew. June 15 – Unofficial Awards ceremony approximately 45 minutes after last fish is weighed. The Waianae Boat Harbor has been refurbished with rebuilt slips recently. At this time, slip availability is on a first-come, first-serve basis for vessels 35′ and under. All requirements per Hawaii Revised Statues and Hawaii Administrative Rules are in full effect. DOBOR is not waiving the vessel inspection requirement for temporary mooring permittees. Please contact them to lock in a slip for your use during the tournament. This will make your morning on the day of the tournament go way smoother then dealing with the long launch line. We believe there are some 25+ slips available at this time. If you’re interested, please call the State of Hawaii, Dept. of Land and Natural Resources, Division of Boating and Ocean Recreation at 697-7085 or email [email protected] . The Waianae Harbor has a new Harbor Master who is normally in the office Monday – Friday. Note: Insurance requirements for the State of Hawaii Harbors is $500,000.00 Liability minimum. Clean sweep constitutes a qualifying Ahi, Marlin, Mahi, and Ono being weighed in. Lucky whitewash drawing is for all boats that do not catch a fish, or pick up catch card. Winner chosen at random. ADDITIONAL MERCHANDISE PRIZES: Team numbers will be selected at random and announced over the radio for a merchandise prize. It is your responsibility to pick up your prize at West Side Marine (Next to Spinners Cafe, AKA the dive shop) no later than 5:00 pm on July 7th.